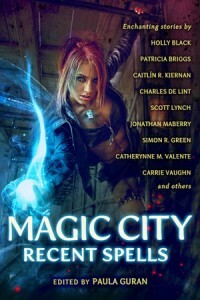 Magic City: Recent Spells has a cracking ToC. This entry was posted in fairy tales, News and tagged Caitlin R. Kiernan, Charles de Lint, delia sherman, Elizabeth Bear, holly black, lucy sussex, Magic City: Recent Spells, nancy kress, Paula Guran, prime books, Vatherynne M CValente. Bookmark the permalink.